Even in a nation famously fanatical about ice hockey, one Fijian sports fan took his love for sevens rugby to a different level. 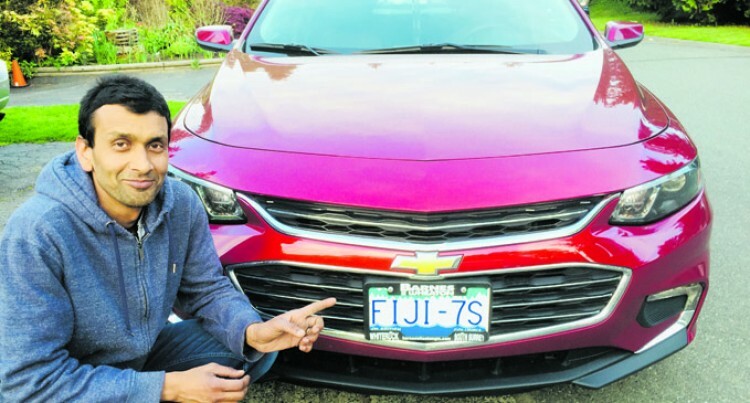 Sameer Izaz Sahib, a Surrey-rite, got himself a signature ‘FIJI 7s’ vehicle registration plate made for his car, a first in the province of British Columbia, Canada. “It’s a rare gem if you will,”Sahib said. “You can call me a Fiji 7s fan number one”. He said the idea came about following the Fiji Airways Fijians 7s team win at the Vancouver Sevens in February. “People may say why rugby and not hockey as Canada has won 9 Olympic gold medald and 27 World Hockey Championship titles, I say, I’m a Fijian first. “And I have been following sevens rugby for way too long. Sahib said he applied for the signature plate with Insurance Corporation of British Columbia, (Motor Vehicle Branch) in March and had to wait for good seven weeks for the delivery. “Seven weeks for a unique FIJI 7s signature plate, just love it. Sahib said the Fiji Airways Fijian 7s team has a huge following in Vancouver, some 20,000 plus strong fans but shell shocked that no one thought about having the signature plate made. “I have seen personalized ones like the district they’re from in Fiji but the sport that have people talking world over and unites Fijians didn’t cross people’s minds. “I guess it (plate) had my name written all over it”, quipped Sahib, the former Waiyavi, Lautoka, Fiji resident. Sahib, who hasn’t missed the World Sevens Series Vancouver leg since the inaugural tournament, said sevens rugby has given Fijians their sporting identity.